There’s still time to register for the only Crappie Masters All American Tournament Trail in Oklahoma. Plan to be at Lake Eufaula on Friday, April 26, 5 p.m. at VFW Post 8798, Hwy. 9 East of Eufaula for late registration and voucher pickup. Anglers will attend the mandatory meeting at 6:30 p.m. to get the rules to prepare for the Saturday tournament. Crappie Masters All American Tournament Trail’s National Qualifier April 27, 2019, on Lake Eufaula, is sponsored by Renewable Fuels Association “Ethanol Fueled With Pride”, American Ethanol, Bass Pro Shops, Lake Eufaula Association, and the City of Eufaula. The tournament will qualify anglers for the 2019 National Championship to be held on Grenada Lake, Grenada, Mississippi. Weigh in will be at South Pavilion Boat Ramp, End of Dabbs Rd off of E1210 Rd, Eufaula, OK 74432. Anglers will fish from 6:30 a.m. to 2:30 p.m. and must be in the weigh-in line by 3:30p.m. The weigh in is open to the public. Anglers, family and friends are invited to come out and cheer on your favorite team to see who takes home the trophy for biggest crappie and all the teams that qualify for the National Championship. There’s fun for young anglers during this event. A free Kids Fishing Rodeo is set for Saturday, April 27 at Eufaula Cove Marina (J Dock), 400 Lakeshore Drive, Eufaula, OK 74432. Registration is from 8-9 a.m. and will fishing runs from 9-10:00 a.m. All kids will receive a prize. Kids will need to bring their own poles and bait. Lake Eufaula Association and the City of Eufaula are able to bring this tournament to Lake Eufaula with the help of many local sponsors including: Dobber’s Roadhouse, Dobber’s C&C Grocery, Nichols Market, OG&E, Stigler Chamber of Commerce, Eufaula Pharmacy, Hopkin’s Fuel and Propane, First Family Federal Credit Union, Sue’s Recycling, Jellystone Park Camp Resort, Lakeview Landing Motel, B&B Bait and Tackle, LAKe Country Diner, Eufaula Cove Marina, and VFW Post 8798. Entry fee for the one-day tournament is $250 plus $35 per person membership fee to Crappie Masters. Late fee of $25 applies after April 13. There’s a guaranteed 100% payback for the tournament. For more information about the Crappie Masters Tournament Trail on Lake Eufaula call 660-351-4187 or go to CrappieMasters.net. 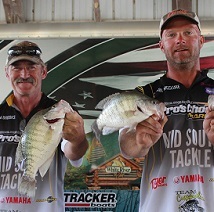 For more information about the Crappie Masters Tournament Trail call 660-351-4187 or go to CrappieMasters.net.